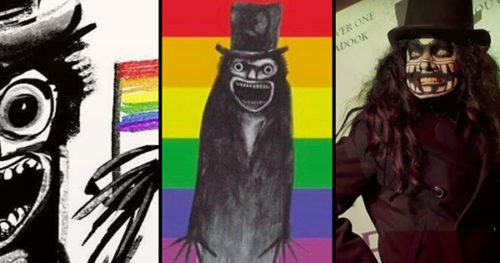 He seems to be everywhere these days, and his name is fast becoming the talk of LGBTQ social media: The Babadook. The Babadook is an evil character from a little-known horror film from 2014 known for wearing a top hat and trenchcoat and he has reemerged as what many consider “the” LGBTQ icon of 2017. Besides, as Tim Teeman wrote in the Daily Beast, his mourner’s black outfit is not only always chic, but also slimming. And yes, his name is The Babadook. His resurgence was catapulted in 2015 by Netflix adding that film to its offerings, BuzzFeed reported. What we know about him we’ve learned from posts on Tumblr, Facebook, Instagram and a whole lot of tweets. Michael Varrati, a screenwriter and curator of Comic-Con’s annual queer horror panel, told Mic the Babadook is a typical outsider, a characteristic that any queer person would recognize. Want deeper understanding? Look no further than Aviva Briefel, professor of English and cinema studies at Bowdoin College. If it’s the character’s lack of dialogue and black-and-white color palette that appeal to many, Briefel said movies like The Babadook — and the 2017 horror film Get Out — also provide opportunities for people to wrestle with their identities. Photoshopping the monster’s image shows a fervent desire to discuss queer identity, she said.